If you come across any bugs, please do let me know. 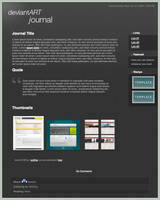 PLEASE NOTE THAT CSS JOURNALS / JOURNAL SKINS ARE ONLY AVAILABLE TO PREMIUM / SUBSCRIBED MEMBERS. Click on the "install to journal" button to add it to your journal skins collection. When editing/updating your journal, click on the button at the bottom of your journal update page which should say "choose skin" or "unsaved skin", select this skin from the list and click 'ok'. If your journal's mood system does not automatically switch to "show as bottom", please make sure to set it in order for this skin to work properly. The links in the menu will auto-change to your username upon install, so you don't need to edit anything there. Replace YYY with topicbox or topicbox2 to segregate a topic of importance like the features section as shown in this deviation. The content will be placed inside a box. Please note that I have no issues with you editing this skin to your own liking (ie. 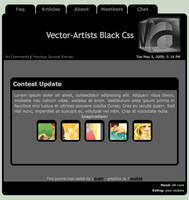 colours, addons, etc). I just ask that you leave a comment below saying so. That shouldn't be difficult now, would it? Using your journal skin, its awesome! used your skin here *KarlJames09 Thank you very much, it was just what I was looking for. Very pretty! I'm going to use today! very nice, clean design! for some reason my current journal skin blew up and i needed a backup until the problem is fixed. thanks so much for making this one free for use. Elegant and beautiful, and matches with dA's color scheme. Perfect! Thanks! Beautiful fits in well with the default skin but looks much better. Thanks for sharing! This is really nice - its very sleek and manageable. Am using your skin, but I removed the border from thumbnails because I'll be using stamps. How do you do the size and text colour at the same time? rather than keeping it in the same quote. Journals have been all fucked up becuase of that new preview feature. 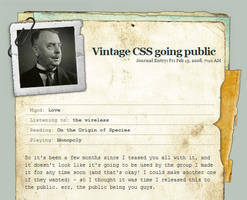 and other CSS stuff to make the headings that come with a lot of skins thanks to it. Hey, is there any way to add some custom links on the top there? If so it would be very neat! By the way - I've used this skin for a few months now and I love it! Just started using this and already my page looks more pro. Thanks for making this journal CSS. Oh this is so, so gorgeous, Thank you so much for sharing. This journal skin is amazing! So simple and clean! And the div tags are easy enough to use. Definitely made sure to so that I can come back and ask questions. I love this one. so much. I love this skin and want to use in my Group Journal... wich is super group... how do i use it?